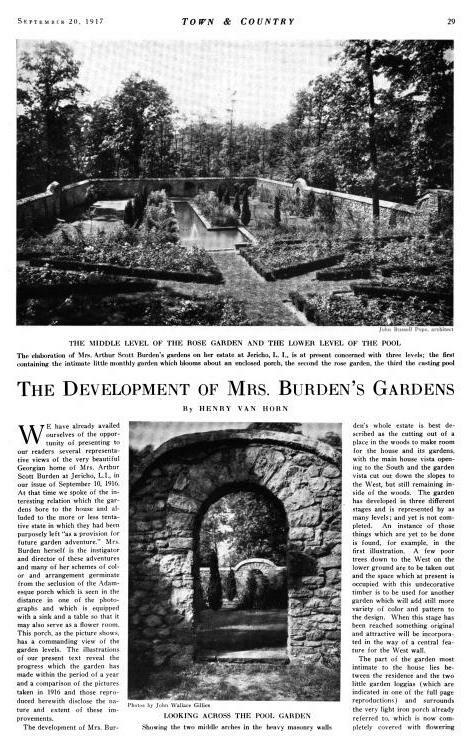 'The Development of Mrs. 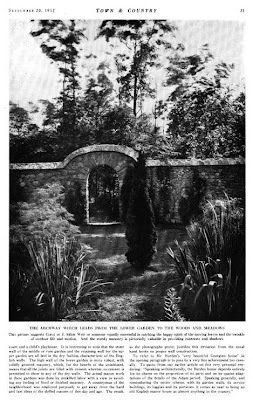 Burden's Gardens', a piece on 'Oak Hill', the Arthur S. Burden estate designed by John Russell Pope c. 1915 in Brookville. Click HERE for more and HERE to see the brochure from when 'Oak Hill' was for sale. Article from Town & Country, 1917. The garden was lovely. I am a big fan of John Russell, but there is something about the exterior of this house that seems off. On the entrance side, it disturbs me that the entablature is visually unsupported at the corners; I would have liked another pair of pilasters. I presume the exterior shutters on the same elevation are so narrow because they are folded back to give more visual room. The interiors look very comfortable. Sadly, all the labor saving devices developed don't take the place of a myriad of hands to weed,edge and trim these magnificent work intensive gardens. So much of the output of the greatest landscape designers of the period has been lost forever. I think that it is almost as much of a tragedy as the loss of the houses they were designed to compliment. Back then, labor wasn't remotely as expensive as it is today. Now, if you're not careful, it's easy to find yourself with gardens than cost a six-figure sum to maintain. Even people with very high incomes often resist that. P.S. 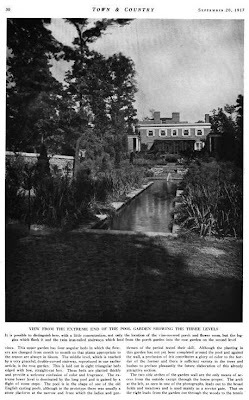 Even Harvard can't afford to maintain Dumbarton Oaks as it once was. BTW, when Zach linked to Templeton II, I remember thinking that there was little left to see of CZ Guest's gardens. Actually, last time I was there- a year or so ago, the gardens still looked much as they did when Mrs. Guest was alive. The gardens were always pretty enough, but hardly breathtaking in scope or execution. I think that people expected more, given all of the publicity she avidly sought and received for her gardening efforts. The reality was a bit more modest. And if, God forbid, Mrs. Guest ever detected the slightest hint that anyone might find things, shall we say, a bit tatty, she grandly dismissed it to their vulgar, Nouveau Riche sensibilities. Footnote: I have nothing personal against Mrs. Guest. That's very interesting. I had the impression that all the planting beds behind the house had been abandoned. Ancient- you may be right. As I thought more about it, I think that I was last there two years ago, not last year. My understanding is that the place is hardly used at all, so it is certainly possible and maybe even probable that maintenance has been dialed back.